This easy butternut squash recipe is also stellar as an appetizer. Plus, you get an antioxidant punch from the pomegranate juice. 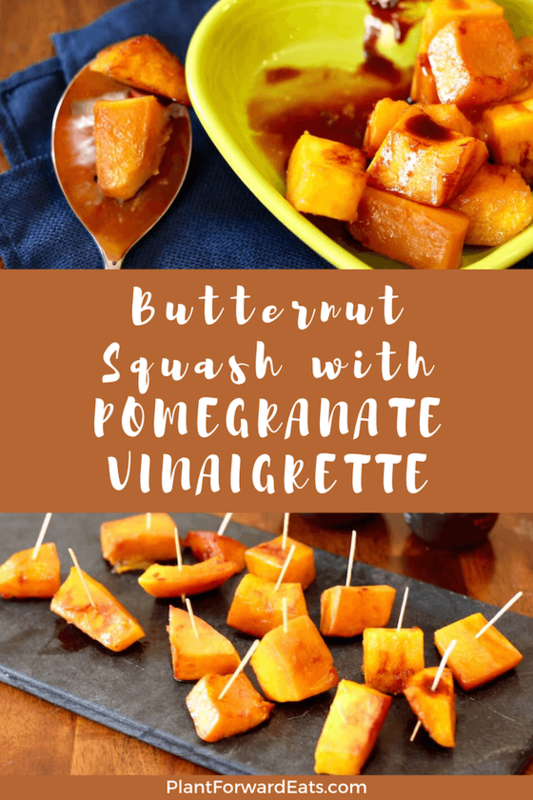 Butternut squash is a good source of fiber and pretty filling (plus it's so tasty), so I love to come up with new ways to enjoy it. I had some pomegranate juice on hand, so I decided to combine it with lemon juice and vanilla extract to create a no-sugar-added sauce for roasted squash. I have to admit that it was around lunchtime when I was getting busy in the kitchen, so I served myself a big scoop of this squash with my lunch. If it's not mealtime, the squash also makes a fabulous appetizer. 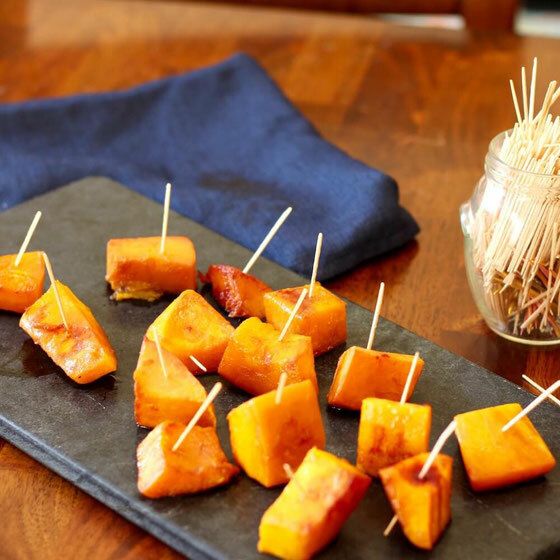 Simply skewer it, place it on a platter, and you have probably the healthiest appetizer that came to the party! We don't traditionally think of getting protein from veggies. But this dish provides 2 grams of protein (4 percent of the daily value) per serving. Plus, it's a good source of fiber, offering 4 grams (16 percent of the daily value) per serving. How to roast butternut squash? I'm here to help, and I hope you enjoy! Preheat the oven to 350 degrees Fahrenheit. 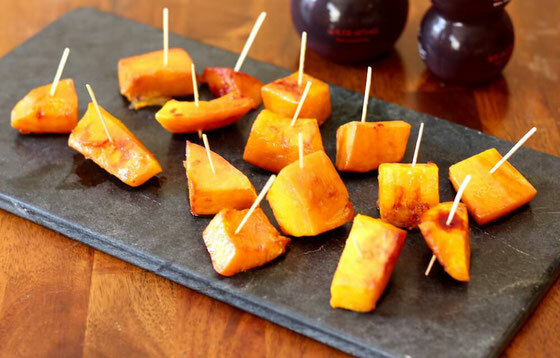 Place squash cubes on a nonstick cooking tray. Toss with olive oil, and bake for 30-35 minutes, until softened and slightly browned. Toss halfway through. Meanwhile, combine juices and vanilla extract in a small saucepan over medium high heat. When mixture begins to reduce, stir frequently until it begins to thicken, about 5-6 minutes. Drizzle sauce over squash. Serves 6. What are your thoughts on this topic? 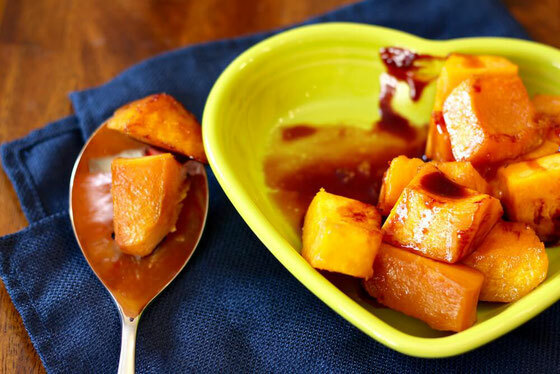 What's your favorite way to enjoy butternut squash?